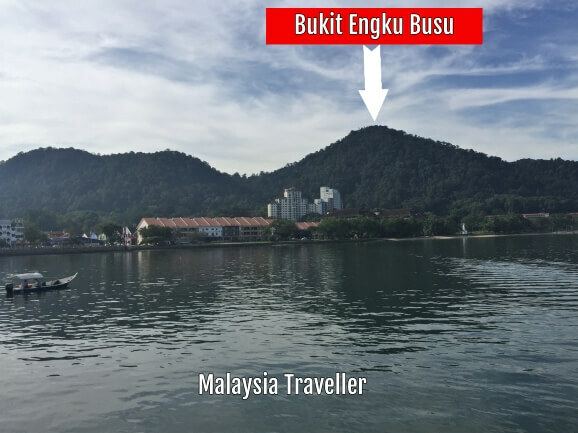 Bukit Engku Busu is a 331 meter (1,087 ft) high hill in the Perak town of Lumut. There is a well marked trail to the summit. The hill does not look very high or steep when viewed from the sea but it was more tiring and challenging than I expected. 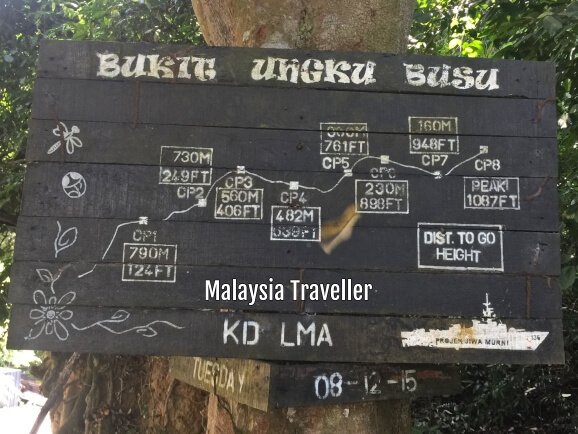 Since the base of the hill is almost at sea level it means the height actually climbed is close to 331 metres and the trail goes straight up almost all the way with only a couple of short downhill or flat sections. 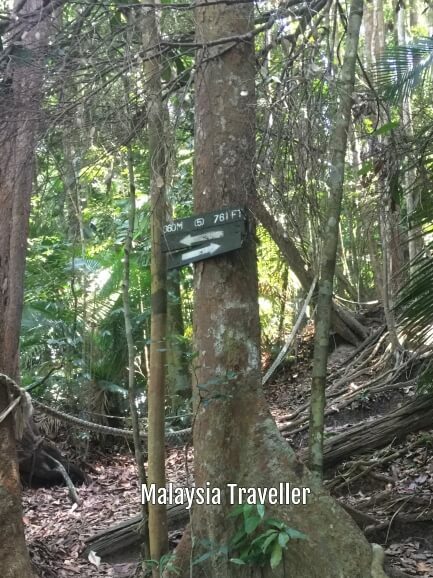 There are 8 stations on the trail and these are clearly marked with signage. 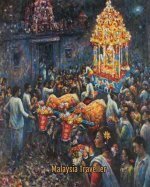 The total distance walked (one way) is 4,500 metres. It took me about 1 1/2 hours to reach the top and an hour to come down. There are a couple of places where you can go left or right. They both end up in the same place so take the route which looks easier to you. 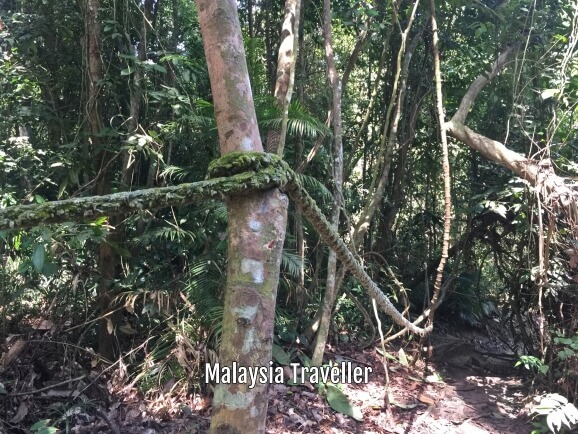 Thick, strong ropes have been tied to trees along the trail to assist hikers. 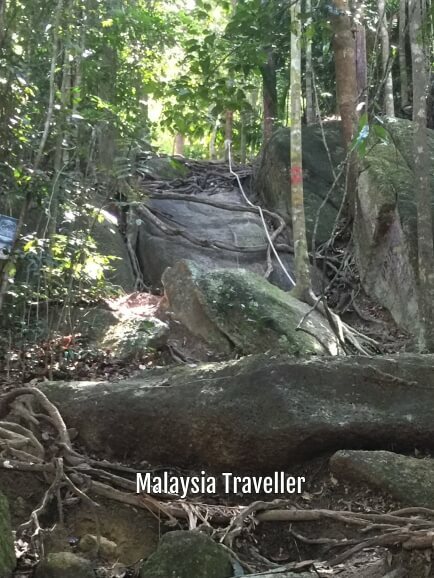 Since this hill is just a short distance from the Royal Malaysian Navy base at Lumut, it is likely that the ropes came from the Navy. 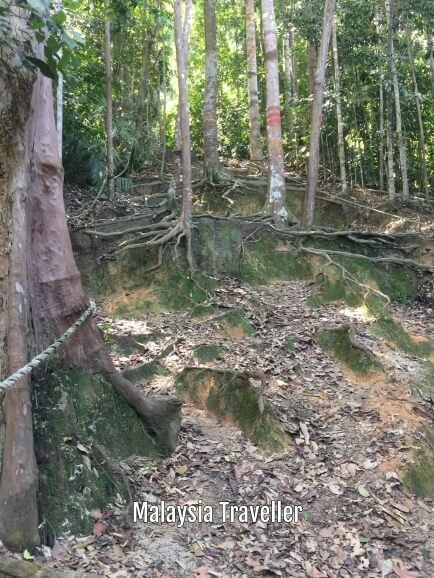 Tree roots have been exposed by weather erosion and climbers' feet. Not good for the trees but the roots make it easier to climb. Between stations 4 and 5 you will reach a giant slab of rock where you have to pull yourself up with the help of ropes (and kind of abseil down on the way back). If you are not comfortable with this there is an alternative route to the left but I don't know if it is any easier. 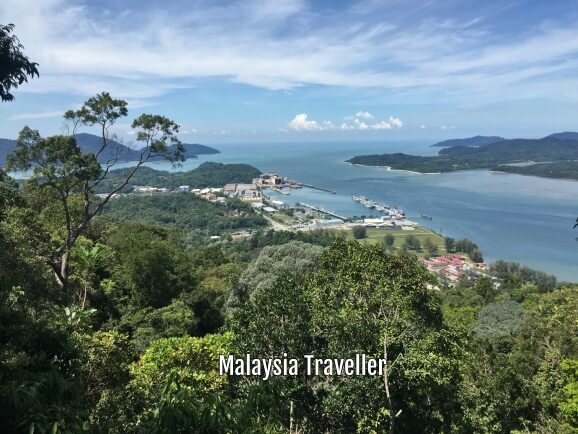 Before you reach the peak there is a clearing in the jungle from where you can get a great view of Lumut naval base, Boustead Shipyard, Pangkor Island and the Damai area. 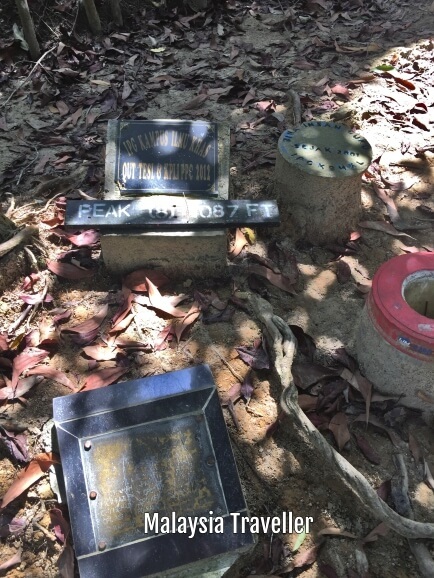 Finally at the peak you will see this sign, which was broken off and lying on the floor to confirm you have reached 1087 feet, next to commemorative markers left by other groups of hikers (unless they are the gravestones of those who died on the way!). There is a picnic table at the top and a communications mast. 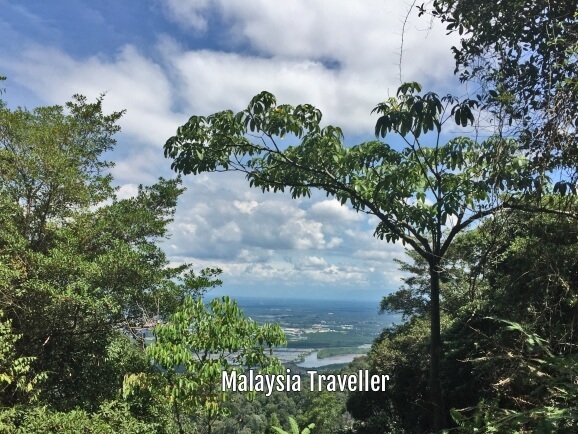 There is also another opening with views over the Manjung River. It was a good hike. Hard work but satisfying at the end. 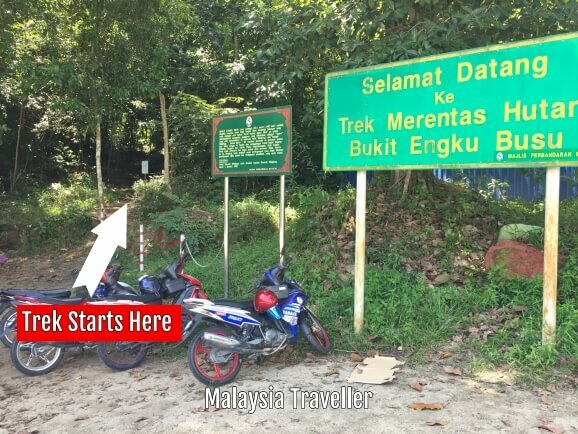 The sign at the trailhead explains that the hill was named after Raja Engku Busu of Selangor who was invited by the Sultan of Perak in the 1840s to help get rid of pirates who were rife in this area at the time. From Lumut Waterfront drive along Jalan Raja Musa. You will pass the Orient Star Resort on your right followed by the police station. 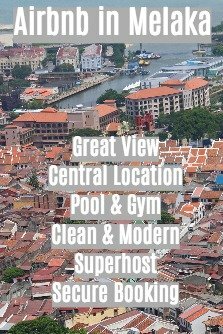 Turn left opposite the police station and head towards some condominium blocks. Follow the road to the end where you will see the sign above. Park here and follow the trail. There are a few spaces to park at the start of the trail. A pack of stray dogs was sleeping next to my car when I finished the trail. Fortunately they were not too aggressive.